Flying Colors, the hot new virtuoso prog rock supergroup featuring drummer Mike Portnoy (ex-Dream Theater), guitarist Steve Morse (Deep Purple), and Neal Morse (Spock’s Beard), follow the release of their eponymous debut album with a rare European tour taking in London’s prestigious Shepherd’s Bush Empire on September 21st. 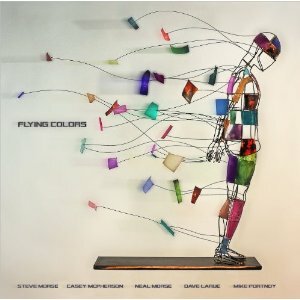 Flying Colors showcases Mike Portnoy (drums, vocals), Dave LaRue (bass), Neal Morse (keyboards, vocals), Casey McPherson (lead vocals, guitar), and Steve Morse (lead guitar). "The album has bits and pieces of what you'd expect from each of us,” says Portnoy. “The sum of all its parts led to brand new, unchartered territory for everyone involved." Flying Colors began with a simple idea: virtuoso musicians and a pop singer joining together to make new-fashioned music the old fashioned way. Refreshing, classic, old and new, the songs are saturated with the many styles, tones and hues of the players who in becoming a band have delivered a unique fusion of vintage craftsmanship and contemporary music.